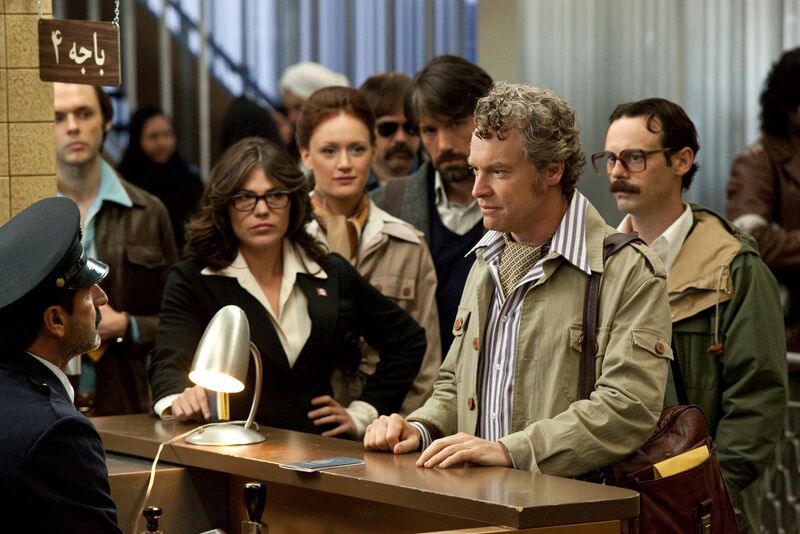 Argo does an outstanding job of establishing both its world and its central conceit in the movie's prologue. 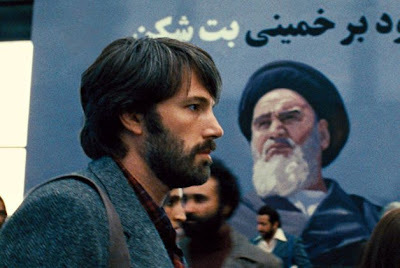 Intercutting between documentary footage and the type of comic book frames used in movie storyboards, director Ben Affleck establishes a key fact that will surprise younger viewers, the closeness of the U.S. and its one-time ally Iran in the years just before the dictatorial Shah was forced to flee the country during 1979's Islamic Revolution. Subsequent sequences depicting protesters overrunning the gates of the American embassy are evocative not only of the actual events they cover, but of the recent embassy protests in Benghazi, Libya where Ambassador Chris Stevens was assassinated. Much of what will no doubt fuel Argo's Oscar campaign—or its chances for Best Picture in the minds of Academy voters—is this prescience or timing. Wisely, though, Argo avoids taking the full-blown Iranian Hostage Crisis head-on, the scope of which would be problematic especially once one has to take the Iran-Contra scandal into account. Instead, Affleck hones in tightly on a smaller-scale incident, the inarguably heroic efforts of three men: Canadian Ambassador Ken Taylor (Victor Garber), who hides six of the American embassy workers in his home at great personal risk, Hollywood makeup man John Chambers (John Goodman), who helps set up the fake science fiction film cover used to get the workers out, and the CIA exfiltration agent running the covert operation, Tony Mendez (Affleck), who must get them all out. As in the best true-life thrillers, Affleck's disciplined focus on the covert escape yields tiny but amazing revelations while allowing the viewer to see the bigger historical picture, bestowing a sense of discovery to Argo not often found in other historical movies. Though the details behind the covert rescue were declassified by President Bill Clinton 15 years ago, it is still surprising to hear of the involvement of the well-known Chambers (Planet of the Apes) and that of Captain America's co-creator, comic-book artist Jack Kirby (Michael Parks), who helped design Argo's fake storyboards (in the film, at least). (Another character, movie producer Lester Siegel—played by Alan Arkin—appears to be an amalgam of real-life film executives.) Mendez, estranged from his family because of his classified work, could almost be a stand-in for Affleck (and indeed all filmmakers) himself, an itinerant whose work precludes a normal family life. When Mendez asks Chambers if he could teach him to be a director in a day, Chambers responds, "You can teach a rhesus monkey to be a director in a day." Despite Affleck poking fun at those behind the scenes (at his own expense), he casts cinematic fantasy as the hero of this political crisis, going so far as to highlight this notion by running Argo's end credits under side-by-side photos comparing the events and persons depicted in the film with their real-life counterparts. I rarely ascribe any intentions or motivations to filmmakers beyond what I read on the screen because, after all, who am I to get inside their head? But there's a familiarity to Affleck's Argo which I can only attribute to a form of twisted nostalgia that I and, I suspect, Affleck are attracted to. I'm only a couple of months older than Affleck so we would have been the same age during the Iran hostage crisis, a seminal moment of our youth. I don't think I'm far off in saying, then, that in directing Argo Affleck, whose film practically oozes with 70s paranoid thriller sensibilities, is also responding to nearly every filmmaker's need to capture a personal moment onscreen and use his film to try to work through any attendant issues. 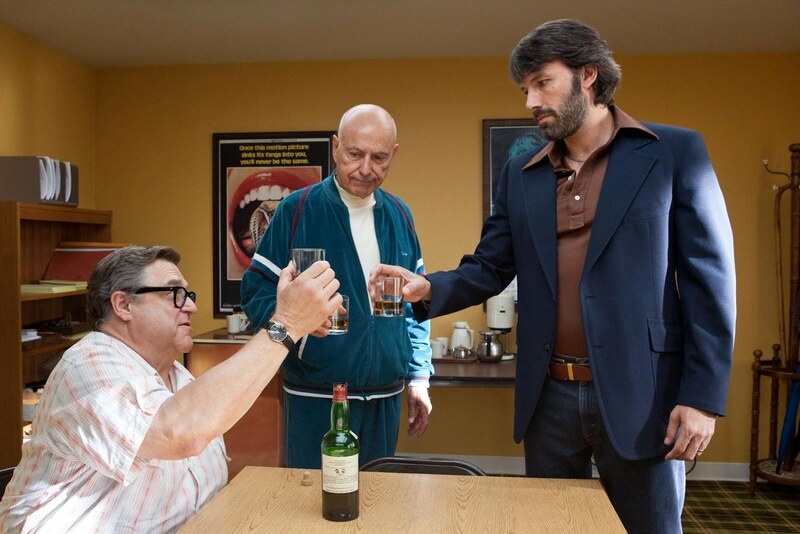 This personal flavor Affleck instills in the film is what ultimately makes Argo an end-of-the-year contender. Obviously, he had no direct involvement in the movie's events. But one can't help but feel his connection to Argo in a way that goes beyond simply directing or playing the lead. The alienation the secretive Mendez feels from his family is palpable throughout, adding to Argo's general sense of disconsolation. There's something odd about Affleck's cutting back and forth between the movie's principal locations and the seemingly unconnected suburban bedroom of Mendez's son. Even though the part it plays is relatively minor in Argo, the obsessive care with which Mendez's son's room is dressed—with period accurate Star Wars figures and bedsheets (down to having the exact wave of figures available at the time on display... I know, I can vouch)—again draws a connection to the role of cinematic fantasy in the context of this secret history and strikes me as a detail meant to call attention to Affleck's childhood connection to the events depicted in the film. For myself, I can say that the hostage crisis was the first time I realized that America was vulnerable and not as well-loved by the world as I was led to believe. That lesson then, and as it has been reinforced by events now, continues to be a disturbing one. Despite being more of a truly personal film, Seven Psychopaths is decidedly less introspective. The film's clever dialogue, placed so artificially in the mouths of gangsters and aspiring screenwriters that represent the movie's surreal LA milieu, make it of a piece with many of the quirky Tarantino ripoffs that filled arthouses shortly after the release of Pulp Fiction. I'm thinking of also-rans like Things to Do in Denver When You're Dead or Keys to Tulsa, crime movies where artifice and brutal reality intersected in the speech patterns of violent characters like Seven Psychopaths' prime mover, Billy (Sam Rockwell). Director Martin McDonagh (In Bruges) attempts to go one step further by making the movie a meta-narrative in which his alter ego Marty (Colin Farrell) seems to be shaping the film's events as he and Billy, his co-writer, shape their script. It's a nice reach, but it's nothing we haven't seen before. 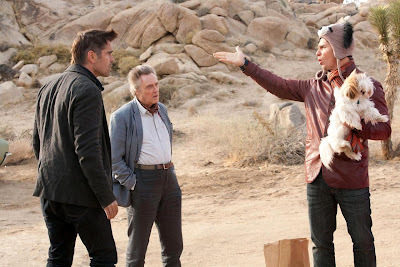 And the setting of Seven Psychopaths, due to its obvious influences, gives it a 20-year-old patina of "been there, done that." Seven Psychopaths isn't bad. It's just second-rate material squeezed into an ambitious misfire that shows a brief, tantalizing bit of imagination. You wrote: " But one can't help but feel his connection to Argo in a way that goes beyond simply directing or playing the lead." I just saw the film and I didn't feel that way at all. Yes, the Star Wars figures are accurate, but I think you're putting more into this than is really there. I like your closing paragraph very much, about America not being as well loved as we thought (I'm 56, so I must be close to Affleck's and your age), so yes, this was a seminal event for me as well. But I don't get the same "twisted nostalgia" you did. To me, this is an excellent telling of this lesser-known story that focuses on the actions of a few brave individuals. Affleck does a wonderful job finding the power of images, as I wrote in my review. Rather than respond here, I suggest you go to my friend Jason Bellamy's post on ARGO, where he and I get more into the weeds on this very topic in the comment section. He disagrees with me as well.